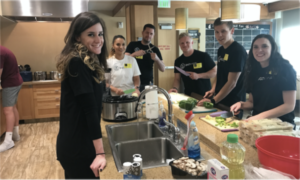 In partnership with the Ronald McDonald Adopt-A-Meal program, volunteers headed up to Primary Children’s Hospital in Salt Lake City to prepare a warm meal for families whose children have life-threatening illness. This program invites friends, families, co-workers, school, community or church groups to cook meals for families staying at the Salt Lake City Ronald McDonald House. We encourage anyone and everyone to take some time to serve those who are going through life’s harsh challenges.